HID Evolution has been gracious enough to present the collective internet with the very first specifications, as well as official images and even pricing, for the very first Asus G55 Series 15.6″ gaming laptop. Known as the G55VW-DS71, the configuration that HID Evolution has unveiled is currently available for pre-order and appears to be a lower-end gaming rig. HID Evolution’s configuration comes with an entry-level quad-core i7-3610QM Ivy Bridge processor as well as the Nvidia GeForce GTX 660M 2GB GDDR5 video card and a $1,475 price tag. According to HID Evolution, the G55VW will be offered with faster processors in future configurations, though there’s no information currently available on better video cards. Aside from the graphics card and processor, the G55VW also comes with 12GB of DDR3 RAM (1333MHz), which is expandable up to 16GB, as well as two drive bays for data storage that can be filled with various hard drives, hybrid hard drives, or solid state drives. 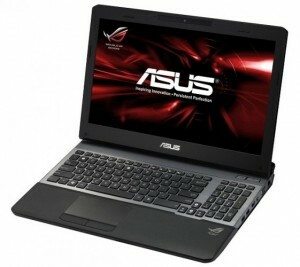 The $1,475 price tag also includes a single 750GB 7,200rpm HDD and a DVD burner with Blu-ray as an option. The screen, which is 15.6″, is a full 1080p HD with a glossy or anti-glare coating. The anti-glare screen also has a 95% NTSC color gamut, though this option adds an extra $125 to the overall price. As far as sound goes, this device comes with a built-in subwoofer and is TNX TruStudio certified. Also included is a 2MP webcam, three USB 2.0 and a single USB 3.0 port, as well as a Thunderbolt port, HDMI port and Bluetooth. Overall weight for the device is 8.48 lbs, including the 8-cell battery. The G55 looks pretty similar to the G75 and, based on the images provided, the only real differences are different fan holes on the rear side of the notebook. Full specifications for the Asus G55VW-DS71 can be found on HID Evolution’s website with the device supposedly launching by the end of this month.